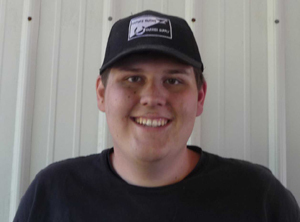 Eric Pruitt – in his third week at the school. When I saw Paul’s ad in the magazine, I was excited to see a school in Arkansas, because I was going to have to go out of state and I didn’t want to. I’m surprised at how many horses we get to work on—it’s great. On days like today we get to get under all the horses we want. I’d talked to some guys at other schools who said sometimes they’d only get to do one foot on one horse in a day. I also like that we’re getting to travel to barns and work in those conditions. It’s not the same just shoeing at a school—that’s not what it’s going to be like after we graduate. With fewer students we’re getting so much instruction directly from Paul. And he stays with you—if you don’t understand something he’ll always come back and explain it again. And we’re getting to see a lot of therapeutic shoeing with him. I feel like we’re getting more depth in what we’re learning here. Charlie Blomstrom– at the end of week 10. My decision to go to Arkansas Horseshoeing School was influenced strongly by Charley Mattingly recommending it to me. 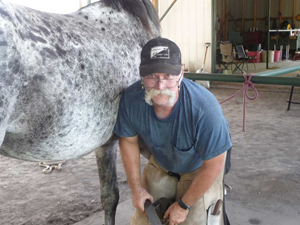 He’s a very well respected farrier and I put a lot of weight on his recommendation. I’d visited another school before and there were 20 students working, with two teachers walking up and down watching. With such small classes here we’re getting a lot of individualized attention. We’re definitely getting under a lot of horses, too. There’s much more therapeutic shoeing than I’d expected and I really like that. I’d definitely recommend the school. I’d looked at schools on the internet and just liked what I saw at Arkansas Horseshoeing School—the way they described what they did. I’ve been trimming horses for 15-20 years and wanted to take the next step. I wanted to learn more than just how to put a shoe on. I’m getting under a lot of horses and there’s just something about him (speaking of Paul). He’s there when I need him–he always takes the time to help. I like watching him do the therapeutic shoeing and it’s something I want to learn down the line. When you can get to where you can do therapeutic shoeing then I think you’re set.There’s this realization of just how much there is to good shoeing. There’s so much that I never had any idea of.